I have heard lots and lots of advice in my year of blogging, and it's about time I reflect on some of the best advice. There's more that I haven't learned and more that I just don't have room to share, so stay tuned for more posts like these. 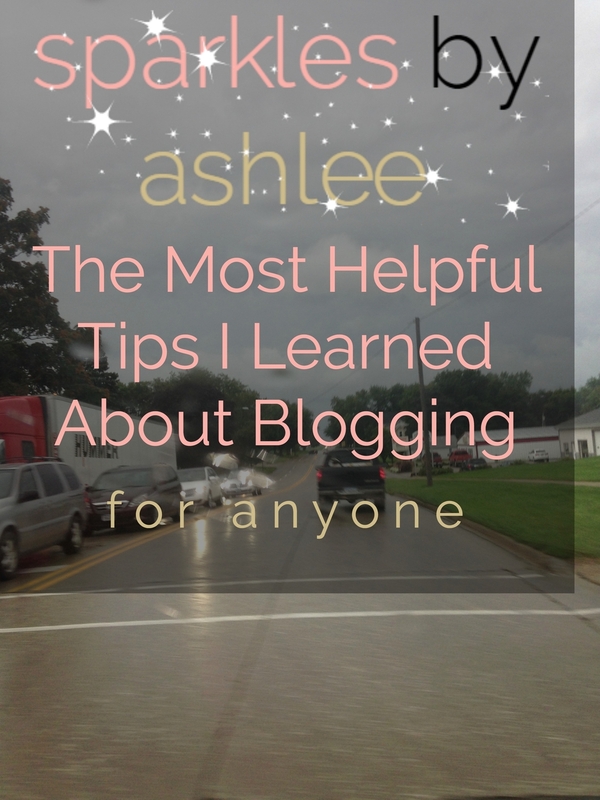 So here are 15 things that have been super helpful for me in my blogging journey. Ready? Too bad, we're going anyway. 1. IT TAKES TIME TO GROW. I have been blogging for a year and have about 200+ followers on social media total including all my accounts (Insta, Twitter, etc. ), and that's really not a lot compared to a lot of bloggers. And you know what? That's okay. Because it takes time - a lot of it danggit - and perseverance. Just keep going on the methods you've found helpful, and keep an open mind. 2. INVESTING IN YOUR BLOG IS PRACTICALLY A NECESSITY. Don't get me wrong - you can be successful blogging, but I'm sorry, not investing in your blog is like not buying warmer clothes in winter. Good luck getting through that season. I'm sorry, but think about all the other hobbies you have. Reading? You gotta buy books. You gotta buy gas to get to the library. Running? You gotta buy sports bras, special running shoes so your feet don't die, athletic shorts, and so on. Name any hobby, I'll give you a list of things you need to buy. You can't just expect your blog to do well if you don't invest in it. You don't have to invest in it right away - make sure you'll like it, but otherwise? You need to put something into it. A domain, platform, design... They're all important, but more on this later. 3. THERE IS NO WAY TO SUGAR COAT IT - BLOGGING IS LIKE HAVING A PART TIME JOB AT THE VERY LEAST. To some it actually IS their full time job! Be prepared to put time and effort into it. I don't want to scare you with these things, but blogging requires money, time, and lots and lots of effort - as does anything you want to be good at. You can blog easily without any of that, but just know you will not get as far as you could. 4. UTILIZING SOCIAL MEDIA IS ONE OF THE MOST IMPORTANT THINGS WHEN GROWING YOUR BLOG. I'm not saying that's right or wrong, but that's the world we live in, and social media can do lots of great things when it comes to your blog posts getting out there. So use it. You don't have to be an expert right away - everyone is still determining the best methods, and it's about what works for YOU. 5. SOCIALIZING AND REACHING OUT TO OTHER BLOGGERS IS HOW YOU GROW YOUR BLOG WITHOUT SPENDING MONEY. Whether that be a comment on their blog post, a reply on Twitter, a comment on Instagram, or just an email to them - that's ultimately how you grow your reputation - by getting your name out there. That, and it's great to support other bloggers. We're all a community. It's fine to be social to help your blog, but just don't make that the only reason you do it [because I'm assuming you know that's just selfish]. 6. IT'S PERFECTLY OKAY NOT TO SPEND MONEY ON SPONSORING. I've been blogging for a little over a year now and still haven't. However, I totally recommend swapping. And if you're not sponsoring, you need to be social. Just don't feel like sponsoring is a necessity. Don't feel like it's not important, either. Again, it's what works best for you. 7. A GOOD BLOG DESIGN IS VERY IMPORTANT. Obviously not everyone will LOVE it, but you still want it to look nice and more importantly: organized, clean, and easy to navigate. I'm sorry, but this is a necessity. You definitely don't need to hire anyone unless you want to, but if you don't know how to do designs yourself, then I would recommend it. 8. CHOOSING YOUR BLOGGING PLATFORM IS LIKE CHOOSING YOUR HOUSE. Just like moving is no fun, neither is switching platforms. I'm not saying you have to spend money right away on a self hosted one, and I'm not saying you have to start on the free ones either. But if you do decide to switch - I mean it when I say to do it right away. I did it when I was only three months into blogging, and I cringe for anyone who has to switch when they've been blogging longer than that. Transferring three month's worth of stuff was not easy (I'm still working on things! ), so just do your research, test things out, get some opinions, and then don't wait! Doing mine early was the best decision I personally made with my blog. 9. DON'T STRESS GETTING POST INSPIRATION. Believe me, when you start your blog, millions of ideas come up. I recommend that you write them all down somewhere. 10. YOUR BLOG WILL NEVER EVER HAVE EVERYTHING YOU NEED ON IT DONE. There is always something, and that's okay. If it's not a new post it's the blog design. Or the pages need to be redone. Or that code needs to be fixed. Or those images need to be redone. Or those posts need to be pinned. It's okay - don't spend your entire life on your blog. It will not blow up if a few things are works in progress. You will not lose all your readers. I promise. 11. DOMAINS AND FACEBOOK AND SEO AND LOTS OF OTHER FOREIGN TERMS ARE NOW IMPORTANT. My best advice is to start reading and start learning them. I read other blogs all the time, and the first section I usually hop to is their posts over blogging - even if I already feel like I know most of it. That's how I got to where I am now. 13. BLOGGING HELPS YOU RELIEVE STRESS. When it's not the one causing you stress... First of all, writing helps me relieve stress, and it really doesn't matter what I'm writing about. I would not recommend your blog being your diary, but sometimes we have to vent. I think you should, but make sure either a) they stay in your drafts, or b) if they're published, turn them into something positive or a lesson or just something real. Not your diary. Do that on Facebook since that's what it's become.